Have you ever wondered why your skin is breaking out? Or why you are getting spots on a certain area of your face? We have all heard that the traditional female hormone related area is the chin or the cliche pimple on the first date. It is very easy to put it down to age, the weather or not eating right. We all know that these are some factors but have you ever thought that the issue could be down to something a lot deeper. Lately I have been breaking out like crazy. I have very dry and sensitive skin so I wouldn't suffer with spots to often. My problem is usually eczema but over time I've learnt how to treat it. One thing I have learnt and am still so interested in is Chinese Face Mapping, it wasn't until I was in college that I was introduced to this method and as I get older my interest has grown. 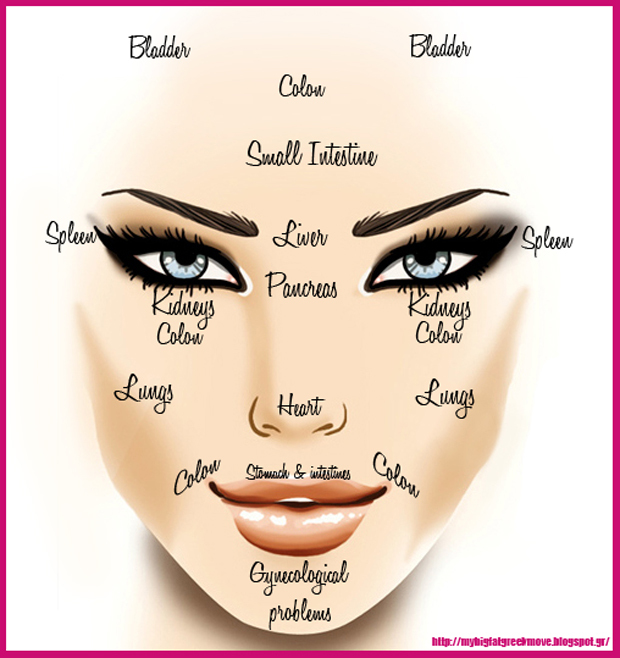 I find it fascinating that each area of your face is linked to a particular organ of the body, think of it like face reflexology. I have started to look very closely at my skin to find out if I can get to the root of the problem. According to Chinese Medicine up to 70% of aliments and disease can be picked up be reading the face. Certain symptoms which show up on your face can indicate what is happening on the inside, such as breakouts, discoloration and texture. These should be viewed as warning signs to improve your health, sleeping patterns or lifestyle. Even the colour of your face can indicate an underlining health condition, such as a reddish hue can mean high blood pressure or cardiovascular disease, a greenish tint could mean low liver function, a pale complexion could be low lung capacity and dark eyes could indicate a decrease in kidney function. Its amazing how much your skin can tell you about your internal health. After all it is our largest organ. Thankfully our bodies and cells have the amazing ability to heal themselves with the help of making positive changes to your diet, lifestyle, activity levels and emotional health can help to balance your body and transform you back to health and beauty. Here are some of the most common symptoms that you might find while you are inspecting your face. 1. A vertical line between your eyebrows: A vertical line between the eyebrows could indicated congestion of the liver. Toxins and angry emotion get blocked in parts of the body and can then lead to disease in various organs. 2. Breakouts and horizontal lines across the forehead: This usually means a build up of toxins and blockages in the digestive tract. 3. Breakouts on the chin and jaw: Are an imbalance in your hormones and could also indicate a blockage in the digestive system. 4. Crow's feet around the eyes: An acidic and imbalanced system placing to much stress on the adrenal system, also a sign of premature aging. Staying hydrated throughout the day and using rich moisturizing eye creams to protect the area effected. 5. Darkness or fluid retention under the eyes: This can be caused my lack of sleep, stress and to much caffeine in the diet effecting the adrenals. 6. A yellow hue on the whites of the eyes: This could indicate a liver condition, excess bile is entering the blood due to damaged liver cells. It is important to see a doctor if this occurs. 7. Red nose or line through the nose: This could indicate a heart or cardiac condition as the nose is linked with the heart. 8. Upper lip: Hormonal changes or fertility problems can be picked up in the upper lip. Look out for changes is colour or structure. 9. Cheeks: The cheeks are linked with the lungs. Changes in your appearance or texture in the hollows of your cheeks can indicate problems with your lungs such as been run down or having inhalation problems such as not breathing deeply enough. As mentioned above I have always suffered with my skin at some stage or another and because of this is why I went on to study beauty and complementary therapies. I have learnt by using my self as a guinea pig that living a healthy and balanced lifestyle it keeps all symptoms at bay.